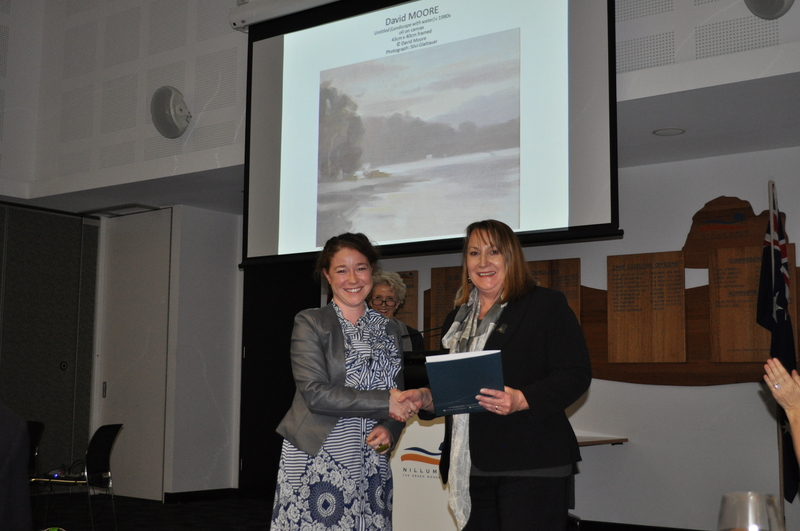 Last month a poem I wrote for the Nillumbik Shire Council ekphrastic poetry award was judged ‘highly commended’. I loved the title of this poem from the start – how does artist evoke a sigh? Both artist and poet create a wonderful serenity; the poet develops this by references to the senses, imagining the soft sound of the artist’s brush on canvas, the scent of the eucalypts. This work is an excellent example of an ekphrastic response. The awards evening was beautifully run. There was a small gallery of the work which was a great opportunity for some of the writers to see the art works for the first time (most of us viewed the works online). All of the poems were read by actress Debra Lawrance (Home and Away, Please Like Me) with images of the artwork projected behind. The awards were presented by Nillumbik Shire Council Mayor Cr Helen Coleman. Melissa Watts with CR Helen Coleman. Photo via Nillumbik Shire Council. The night was a bitter-sweet night for me, I kept thoughts of my fellow Ballarat Writers ekphrastic poet Pamela Miller close by. Pamela had passed away earlier that week, she was such a great writer and participant in all of the Ballarat Writers ekphrasis projects. 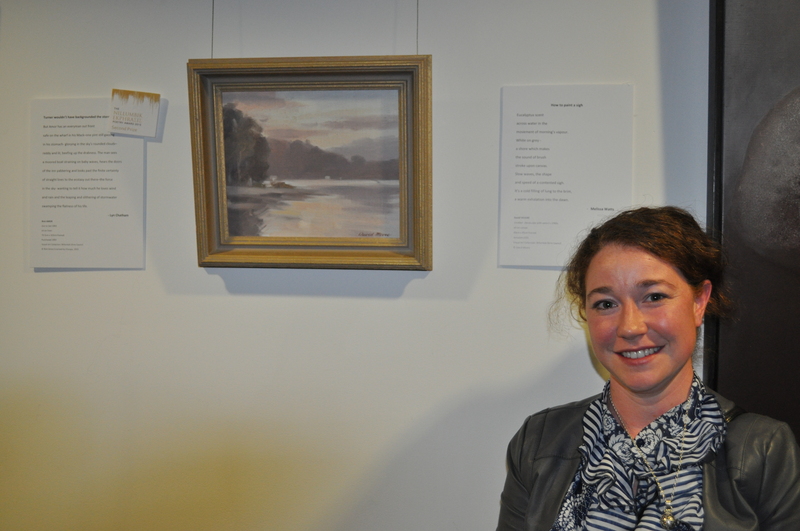 Melissa Watts with artwork – David Moore, Untitled. Photo via Nillumbik Shire Council. The competition is open each year to writers all over Australia so keep your eyes peeled for next year. 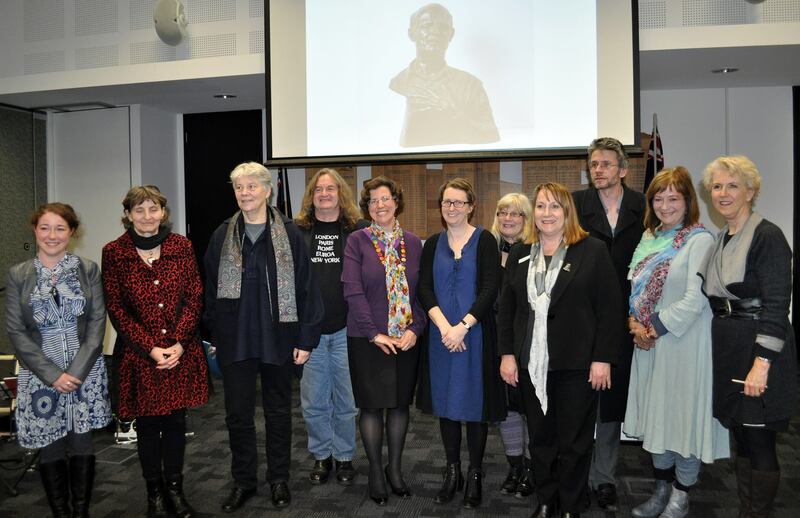 Nillumbik Ekphrasis Poetry Award Ceremony 2015: Melissa Watts (commended), Lyn Chatham (2nd Prize), Sandra Renew (commended), David Kelly (commended), Jo Wilson Ridley (commended), Helen Bradwell (3rd prize), Helen Lucas (judge), Mayor Cr Helen Coleman, Steve Smart (judge), Karen Throssell (judge), Debra Lawrance (special guest reader). Photo via Nillumbik Shire Council. Congratulations, Melissa, on a your commendation. A beautiful ekphrastic poem. Thanks Angela, I really enjoy ekphrasis, and it’s good to have some short challenges when I’m chugging away on a novel. Thanks Jeffery, it’s great to have some great local competitions in Victoria. 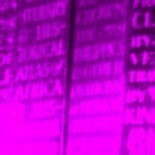 Have a try on the Southern Cross Literary comp: http://www.ballaratwriters.com I liked it, glad there was a glossary though. Hi Melissa, I would like to introduce Ekphrasis poetry next month to an artists network I facilitate. I’d very much like to use your poem and the landscape image as an example to show. May I copy the image above from the Nillumbik pdf to show as an example of a beautiful ekphrastic poem, with acknowledgement? Hi Christina, I’d be honoured to have my poem used in this way, it’s fine with me. However I don’t own the image, perhaps the team at Nillumbik could help you with that? Goodluck with the course. This entry was posted on July 16, 2015 by Melissa Watts in Awards, Competitions, ekphrasis, Poetry, Prizes and tagged Awards, Competitions, Ekphrasis, Nillumbik, Poetry, Prizes.